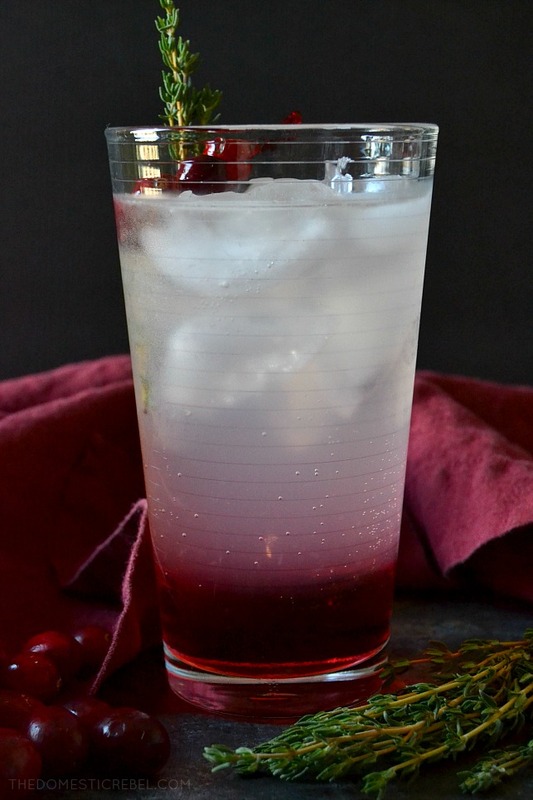 This Cranberry Thyme Vodka Lemonade is fizzy, refreshing, zesty and earthy with a hint of sweetness. It reminds me of strong, straight-forward Capricorns! Hi! Welcome to my first post of 2019. I’m starting a new series I think you’re going to love (and if you watch me on Instagram, you know about already! ): Zodiac Cocktails! It’s no surprise that I am a HUGE astrology nerd. I have countless books on the subject, follow tons of zodiac meme accounts on social media, and talk about it constantly. I just love it, and a lot of people feel the same – whether you randomly check your horoscope once in awhile or you’re an avid follower like myself. Each sign is so different and have varying aspects about them when it comes to personality, work, home life, inner thoughts and desires, and even colors and flavors! I decided I wanted to create this Zodiac Cocktail series so I could create unique cocktails that I think best correspond with each zodiac sign. Each month, I’ll post a new cocktail recipe during the time of the new sign, and this month we start with Capricorn! Ruled by Saturn, Capricorns are strong, serious individuals with high ambitions that are not to be messed with. The cardinal earth nature of Capricorn means these sea-goats are highly responsible, often demanding and dominant figures in any group, including work and home life. Practical, realistic and pragmatic, Caps are usually very wound-up and serious about everything but secretly, they’d love to loosen up if they didn’t fear coming off as foolish. Capricorns love security (financial, relationship-wise, job) and are loyal to tradition. Caps have high but realistic standards, but they can be very unforgiving, overly critical, anxious and let their perfectionist tendencies override. However, most offer sound advice, are great organizers and are loyal partners. As I mentioned earlier, Capricorns value tradition and they’re loyalty to tradition extends to what they eat, too. 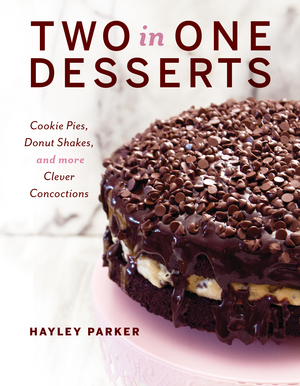 Oftentimes they will eat the same thing over and over, or stick to foods they enjoyed in their childhood with familiar flavors. Some of the flavors associated with this cardinal earth sign are: cranberries, kale, fennel, leeks, cauliflower, tarragon, and thyme. In keeping with the earth theme, I wanted to create an earthy-kinda cocktail. No, it doesn’t taste like potting soil water; it has a lovely earthiness without being grassy or dirt-y tasting. When I was choosing the cocktail for Capricorns, I wanted something a little traditional but with a twist that I think even the most conservative Capricorns would love. And what’s more traditional and classic than a vodka cranberry, right? This two-ingredient drink is a staple at many a bar around the world, but it could use a little Capricorn zshushing up with fresh, lemony thyme and zesty, sour lemon. Enter: Cranberry Thyme Vodka Lemonade. This drink surprised me with how delicious it is, despite its simplicity and not-sweet flavors. 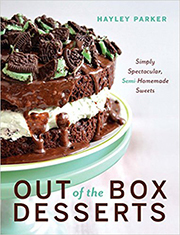 I’m usually a sugar-laden drink fan, so I loved how refreshing this was without all the sweetness. You start with arguably the earthiest liquor there is: vodka! It sometimes comes from potatoes, which doesn’t really get much earthier than that (although now it’s more commonly made with sorghum, wheat, or barley). 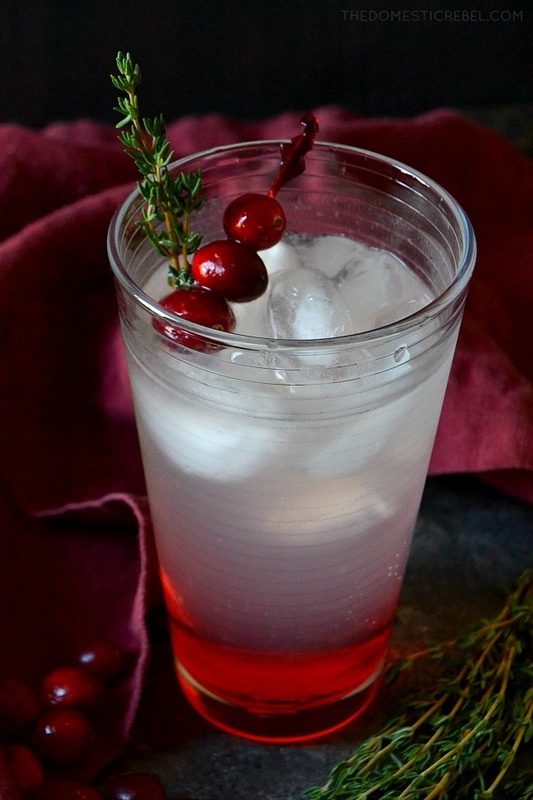 Next up, you have your cranberry thyme syrup, which couldn’t be simpler: it’s just reduced cranberry juice simmered with fresh thyme, then strained and cooled. This gives the cocktail that gorgeous garnet color (also Capricorn’s birthstone!) and gives the cocktail just a hint of sweetness without being overpowering. Finish it off with sparkling lemon water or club soda if you’d like for the fizz and that refreshing zip and bite. So good! If you’ve never really worked with thyme, or you’re thinking, don’t I use thyme to season stuffing for Thanksgiving?, thyme is a wonderful herb that’s often overlooked. 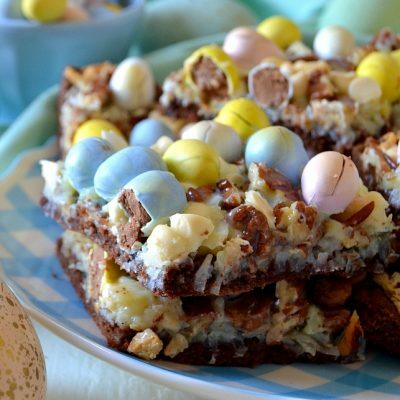 It has a subtle aroma with an earthy bite and a hint of sweetness. The undertones are warm and peppery and pair beautifully with the sweet cranberry syrup. Thyme and lemon are also BFFs in the culinary world, so the herb has a lovely contrast with the fizzy lemon water. 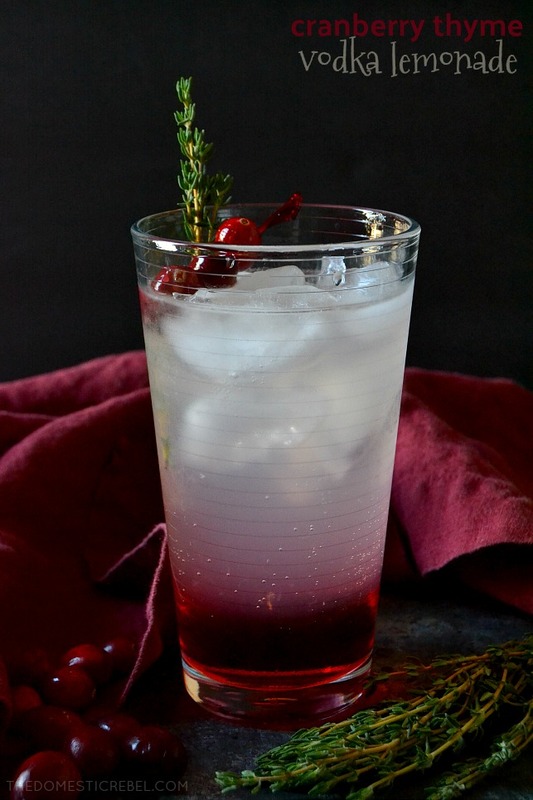 Because of the sugar content in the cranberry thyme syrup, it will sink toward the bottom to create that cool ombre effect in the glass, even when stirred to combine! It just naturally settles toward the bottom. Just FYI! Now let’s toast to those serious but lovable Capricorns! This Cranberry Thyme Vodka Lemonade is super refreshing, fizzy, earthy and bright with a hint of sweetness from the homemade cranberry thyme syrup. The perfect cocktail to represent the strong and traditional Capricorn zodiac sign. First, make your cranberry thyme syrup. In a small saucepan, combine the cranberry juice, granulated sugar, and thyme sprigs over medium heat, stirring to break up the sugar. Bring the mixture to a boil, then reduce the heat and simmer for 2 minutes, stirring occasionally, until sugar dissolves. Strain the syrup to remove any thyme leaves and allow the mixture to cool before serving. To assemble the drinks: Add ice to a tall glass of your choice. 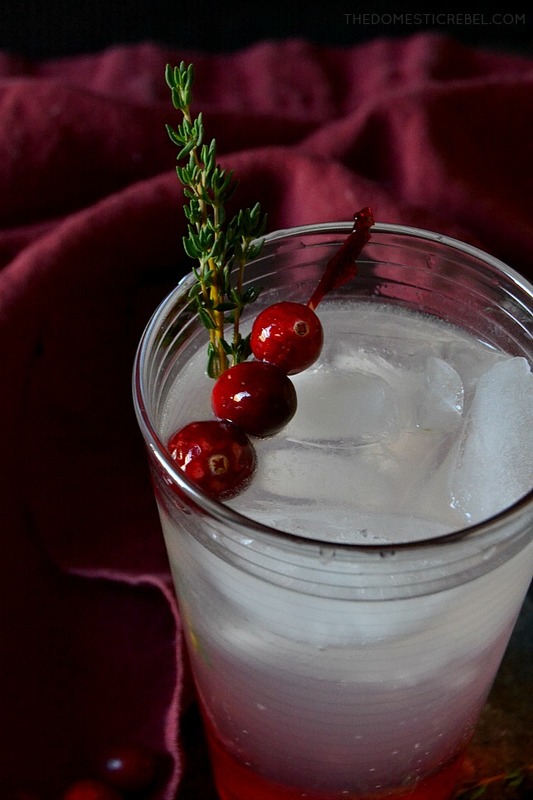 Combine the cranberry thyme syrup, vodka and fresh-squeezed lemon juice to the glass. Stir with a cocktail stirrer. Top with sparkling lemon water or club soda. Garnish with thyme sprigs and a skewer of fresh cranberries. Store leftover cranberry thyme syrup in an airtight container in the fridge for up to 2 weeks. Cranberry thyme syrup makes about 1 &1/4 cups worth. Refreshing, zippy, bright and earthy with a subtle hint of sweetness, this Capricorn Cranberry Thyme Vodka Lemonade is perfect for those headstrong, loyal traditionalists! This looks cool. Can I use any alternate for Vodka? Hi Ellen! You could try gin or rum! Rum will obviously give it a more tropical kinda flavor, but gin would give it a floral flavor which would be really nice with the cranberry thyme syrup!